For special applications. This 15-ft product is a supplement to our other fish tapes. The difference is the miniature tip that is exactly the same diameter as the 3/16" rod we offer in a longer length. Another complement to our growing Telescoping Pole and Push-Pull Rod family! 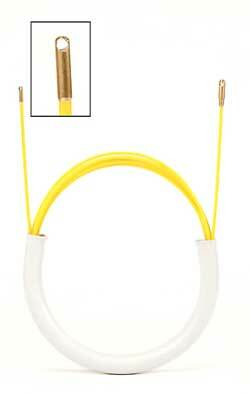 Mini tip can penetrate areas the standard 1/4 inch tip can't (fully loaded conduit or any small diameter opening). Non-conductive polypropylene coated fiberglass won't rust of corrode as with metal fish. Suitable for carrying in a briefcase. Click here to see all the tips that fit the Mini-Fish Tape.